← 4th Anniversary Giveaway Winners Announced! 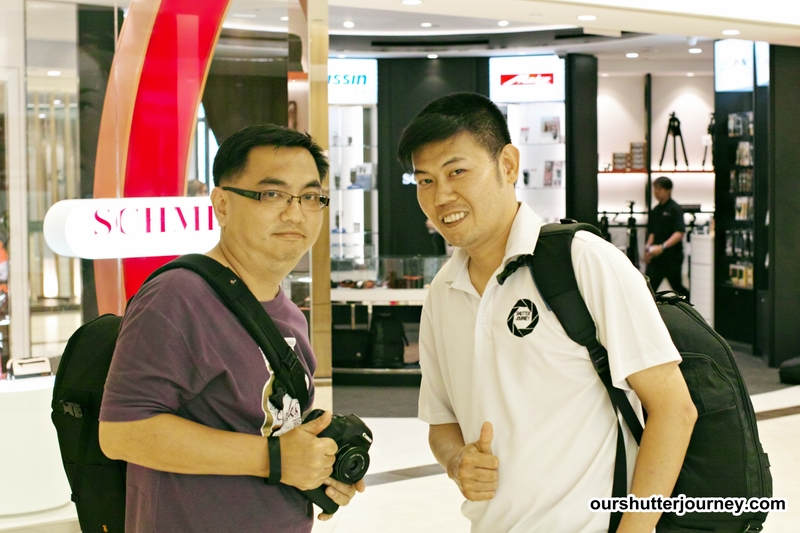 19th March, Singapore – Recently I happened to be at Ngee Ann City with another 2 photographer friends to discuss a project on colorful cameras. After our discussion, we decided to take a walk & relax. 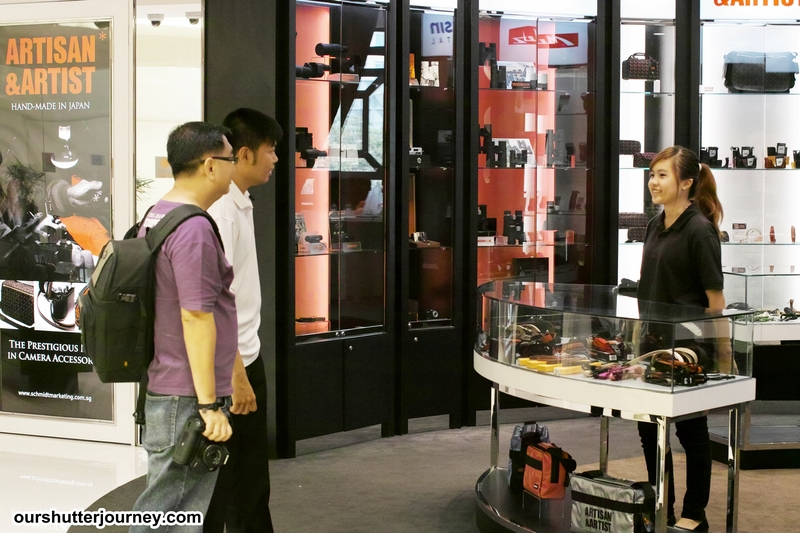 As we are the typical camera-minded-photographer-who-are-never-sick-of-looking-at-cameras males – and me as a review editor at that, we headed straight to level 5 where there are many electronics shops so we can while away some time. While loitering, I discovered an interesting shop. 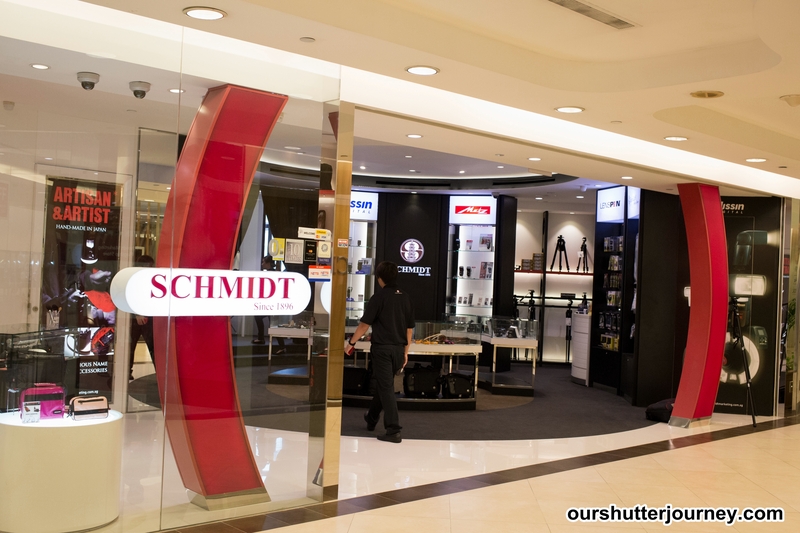 I never knew that Schmidt Marketing has a Flagship Store at Ngee Ann City. Standing outside the shop, I did a quick glance and hatched a naughty plan. 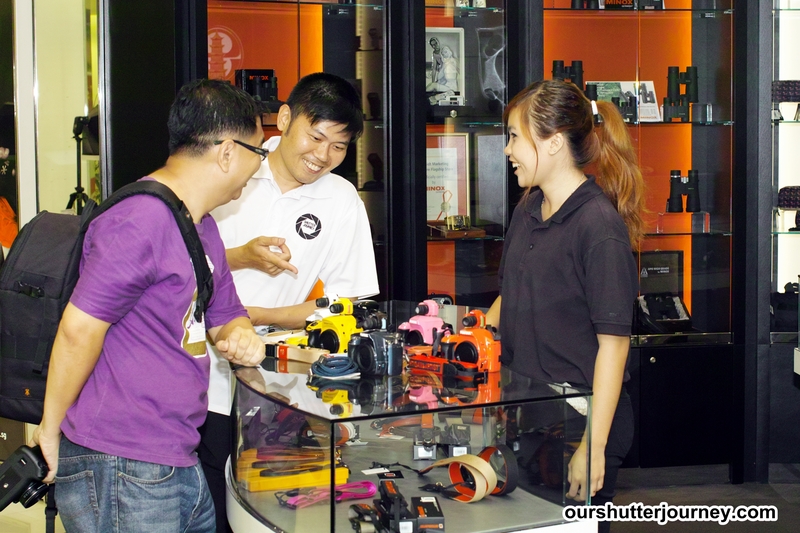 So I beckoned my friends over and I shared with them that since I had brought along my colorful cameras, maybe I can go inside the shop and irritate some people with a prank. And it was agreed that both of them will shoot the whole process secretly. KC will shoot from outside the shop while Benny will accompany me into the shop and secretly shoot the prank at closer range. we are soooo bad. Photo: And here we goes. 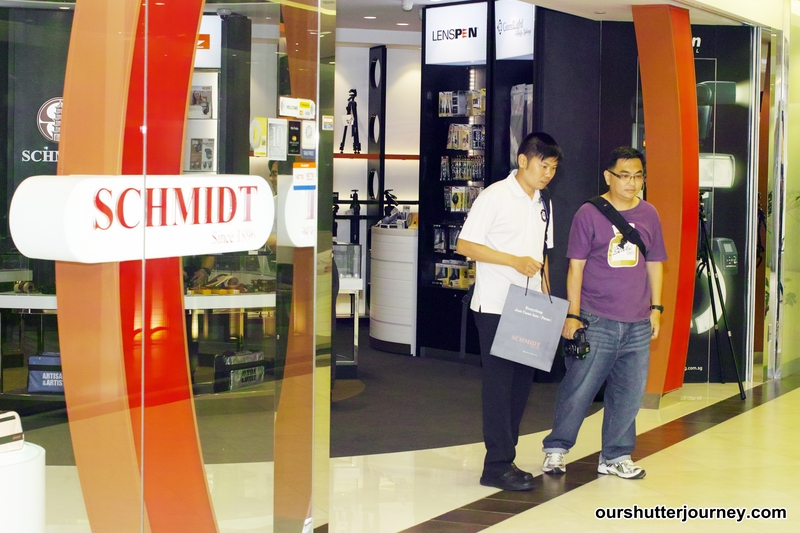 Benny & me entering Schmidt Store – all ready to create some “disturbance”. Since the theme for our project was “colors”, I decided to head to the camera strap counter where the full range of Artisan & Artist* camera straps are on display. 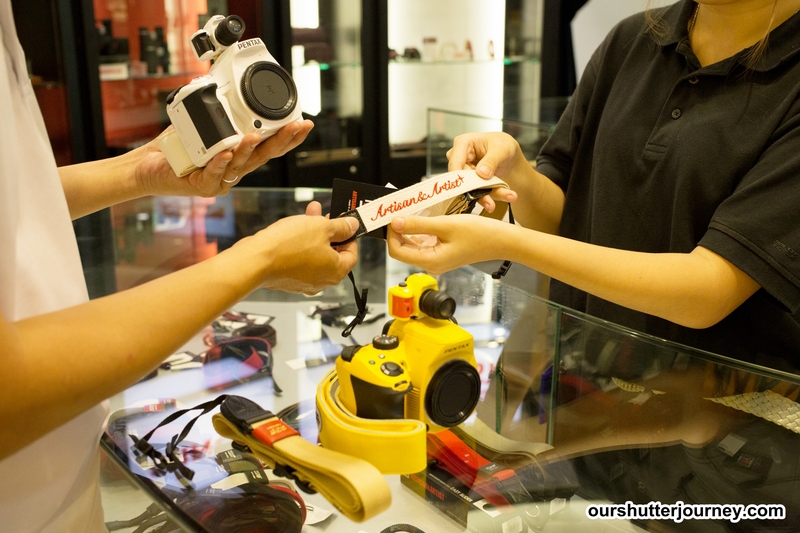 Benny started their “auto roam” around the shop – with his cameras ready while KC will have an overview of the prank from outside the shop. Photo: We got greeted professionally, feels great actually. The store executive greeted me warmly and (seriously) I felt really welcomed. 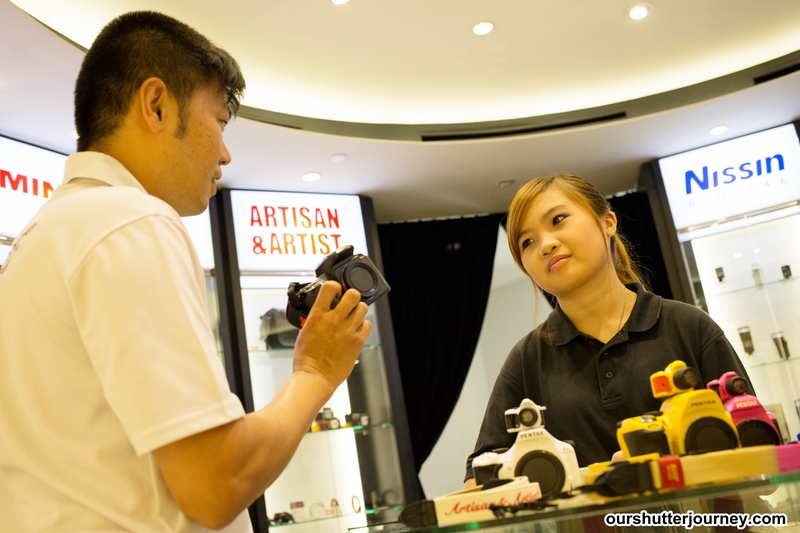 The shop feels classy and upmarket – totally different from the camera shops that I had visited. Warm lightings, spotless glass displays and everything is neat and tidy. So I started my prank. 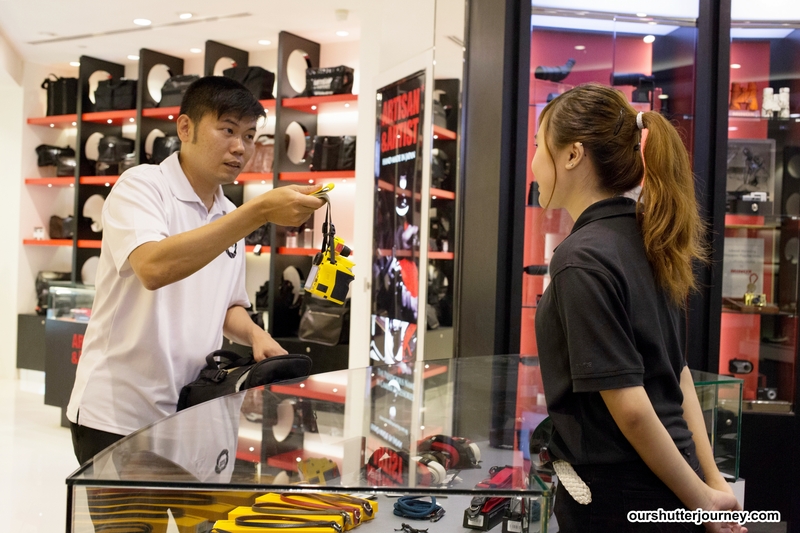 I informed the store executive that I was looking for a DSLR strap for my camera. 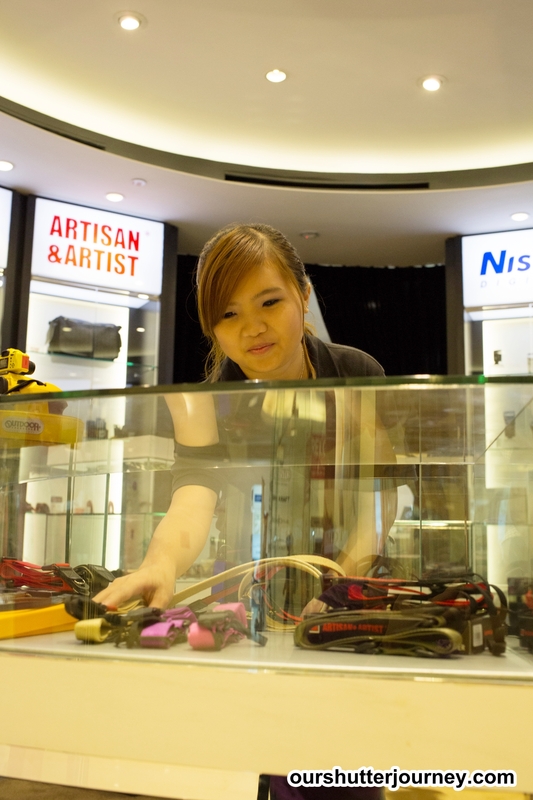 Then I was informed by Winnie, the store executive that Artisan & Artist* has a comprehensive line of straps for multiple applications. 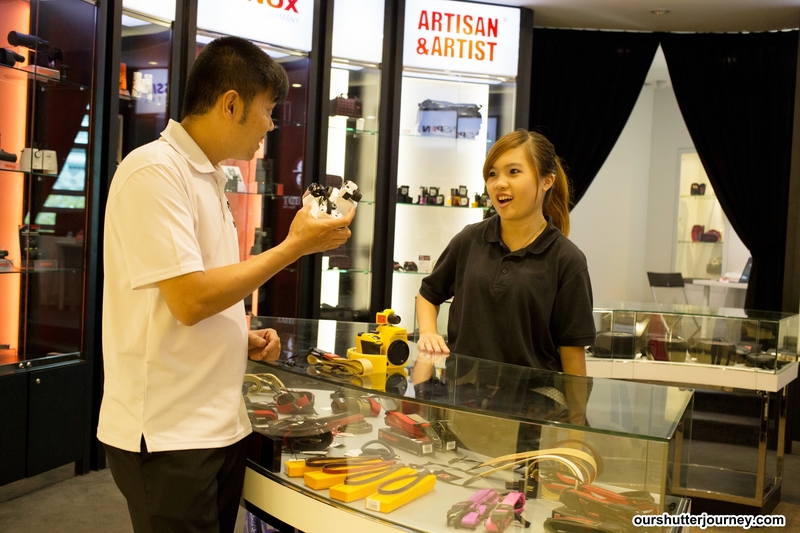 Photo: Customer Service Executive Winnie introducing the various Artisan & Artist* Straps to me. Top photo shop from outside shop by KC & the close range photo shot by Benny secretly. Photo: I started with my Yellow DSLR. With a poker face, I digged into my camera bag and pulled out a Sunny Yellow camera and calmly placed it on the counter. ” Find me a strap that matches the color of my camera.” – I said. Winnie calmly opened the display case and seems to have a strap in mind and she handed me a Beige colored strap. I took the strap and studied the stitching and to my surprise, the Artisan & Artist* strap is near perfect with enforced stitch lines and the feel of the textures are good. So I decided to pull the trigger. I asked Winnie to hold on as I took out my Super White Camera next. She seems a little stunned since most cameras are black in color. Told her the same that I need a matching Artisan & Artist* strap for my white camera. Winnie took another strap out from the display and handed to me. It was a white double woven & stitched strap with the word Artisan & Artist* word embroided in bright red. Indeed a perfect match for my white cam. Containing my excitement, the show must go on. As the menace continues, the Electric Pink camera is next. Since most ladies love pink color, when I took out my Electric Pink camera, Winnie’s reaction was epic. Anyway, she will probably have a hard time since pink camera straps are hard to come by and good quality ones are even more rare. 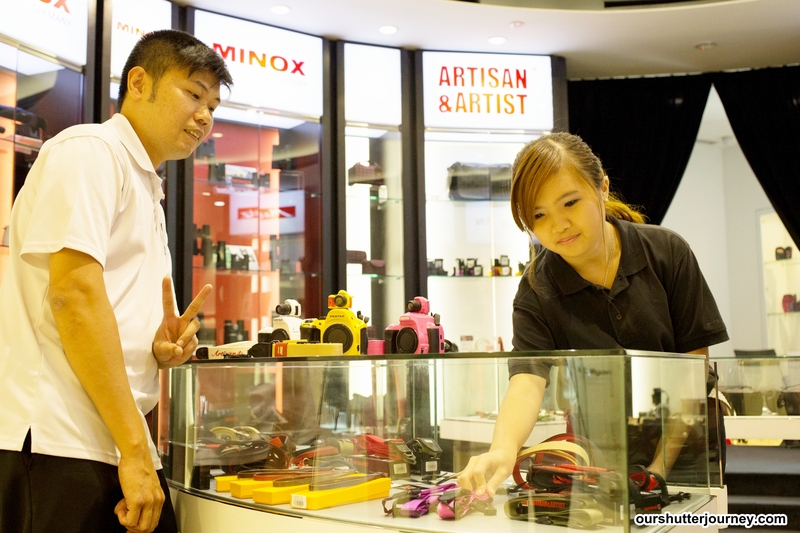 Photo: Sneaking a little victory sign as Winnie finds a strap for my pink DSLR. Photo: And she did found a Pink Strap! From my above facial expression you can see that I am truly surprised. Artisan & Artist* indeed has almost every strap for every color & occassion! And the pink strap was made as tough just like the previous straps that Winnie had showed me earlier. At this point, after 3 cameras, prank or no prank, Winnie has won me over as a customer. 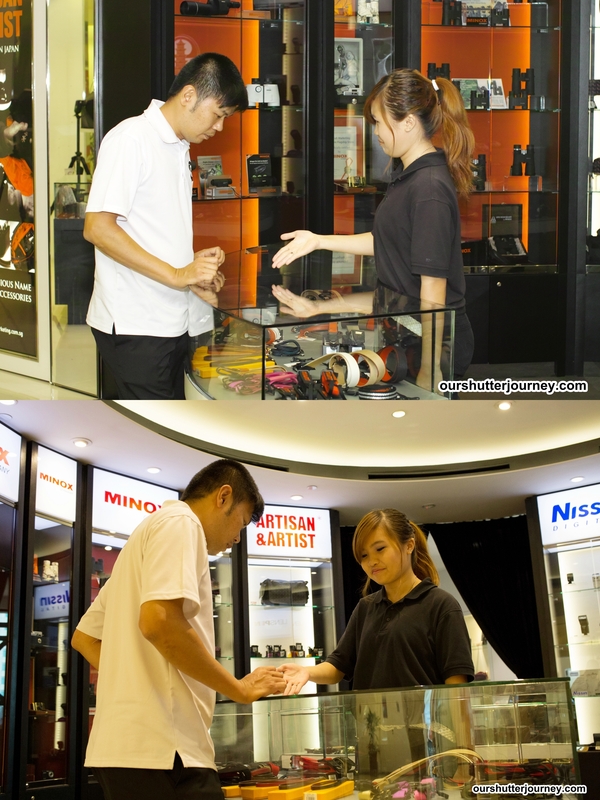 Her patience are commendable and Schmidt did a great job training their sales associates. Since I am halfway through my prank, I have to finish this. Next to hit will be my Crimson Red camera. Apparently my appearance with my colorful cameras has given Winnie surprises after surprises. I was wondering what will she do at the end when I told her I will need to consider before buying all the straps. At the same time, I wonder what was going through her mind facing me, this crazy guy with so many cameras in different colors wanting a strap to match each camera. However, in my mind, I was thrilled at the Artisan & Artist* straps. These are really high-end stuff with excellent material and stitchworks. 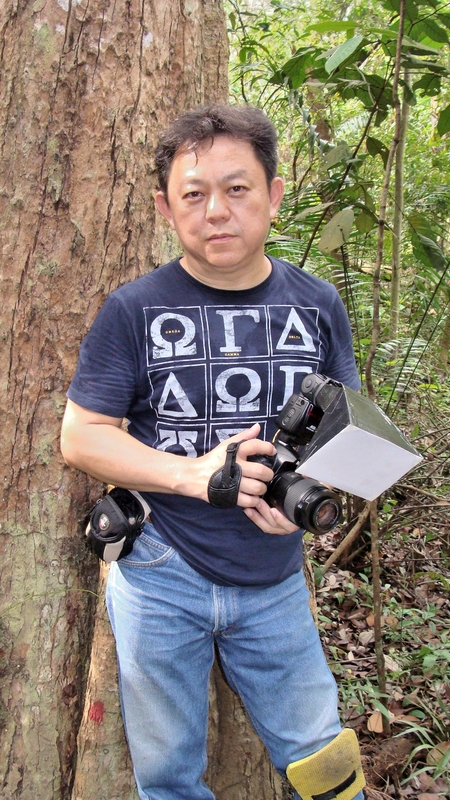 The blue Artisan & Artist* strap selected by Winnie was a Medium Format type, this heavy duty strap eases the weight on the user’s shoulder as it “bounces” the camera off the shoulder when used. This interlooped semi woven and stitched strap is well known in the market and highly sought after by Leica users or other range-finder owners. 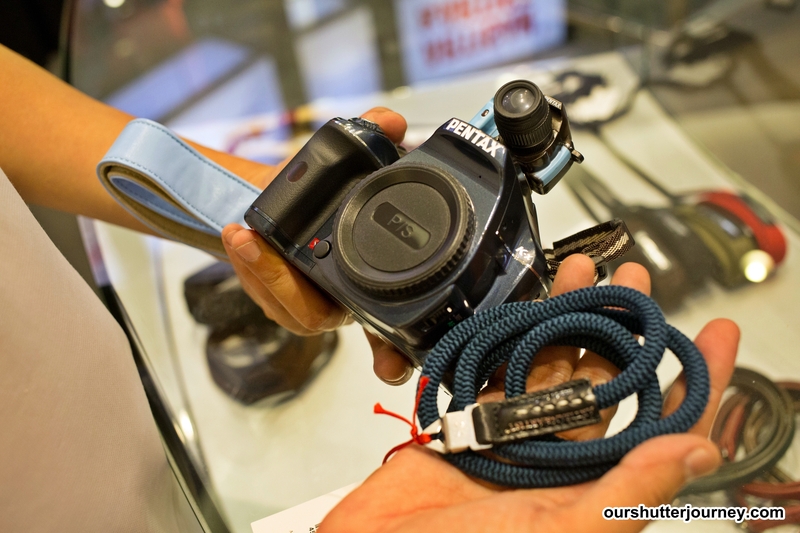 The blue hue was a perfect match for my Navy Blue DSLR. I was later told that this strap is so strong that someone can actually hangs from it and it will not break! Wow! It’s been almost 15 minutes since the prank started and it’s time for the finale, the Black camera’s turn to make a cameo. 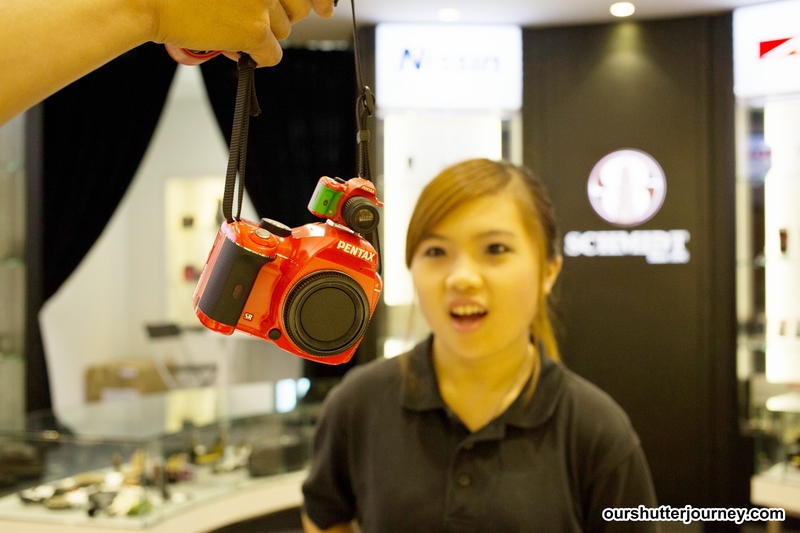 Photo: Told Winnie that this is the last camera that I had. After Winnie took out another Black strap for me, I beckon Benny over pretending to ask him for his opinions on Winnie’s selection. And all Benny said was “Good, Good Good”. I feel like stangling him at this point of time.. But in my mind, he is right. These are probably the best camera straps that money can buy. Good quality, handmade, seamless work of art and made to last. For those new to Artisan & Artist* products, these are made in Japan. Photo: Benny sabotaging me by saying every strap that Winnie selected is good! Right, so you might be able to guess what happened next. I decided to buy up the whole lot of straps. 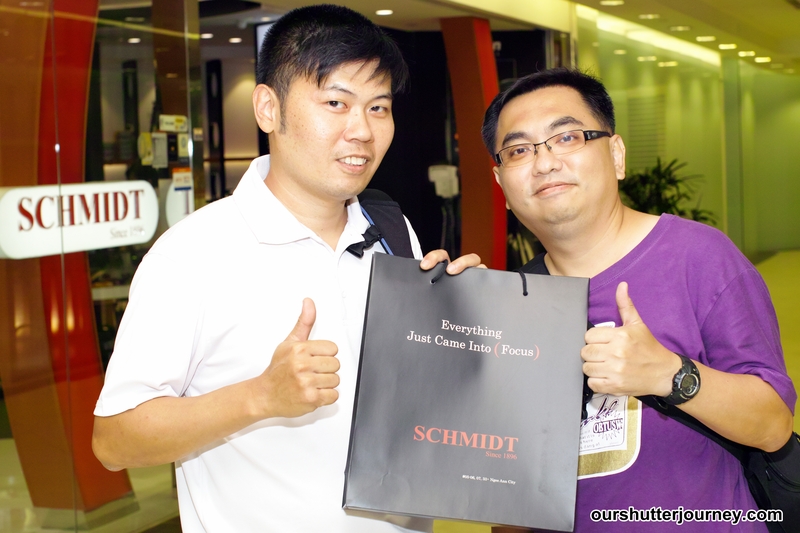 Photo: The Shopping experience at Schmidt was a great one. Well, prank or not, I must say that I have made a wise choice in purchasing the whole lot of Artisan & Artist* straps. Although these straps are not exactly cheap, but cheap things don’t last remember? Photo: Outside the shop with my Artisan & Artist* purchases & Benny our secret photographer & partner-in-crime. Photo: KC – our secret photographer & partner-in-crime. This is the day that I made 2 discoveries. 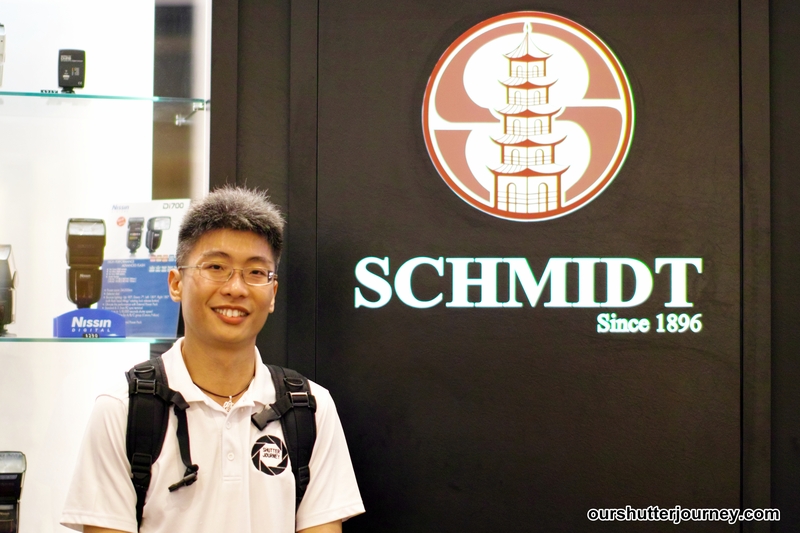 1st was finding a Schmidt Marketing Flagship Store at Ngee Ann City level 5 (which I shamelessly didn’t know there’s one). 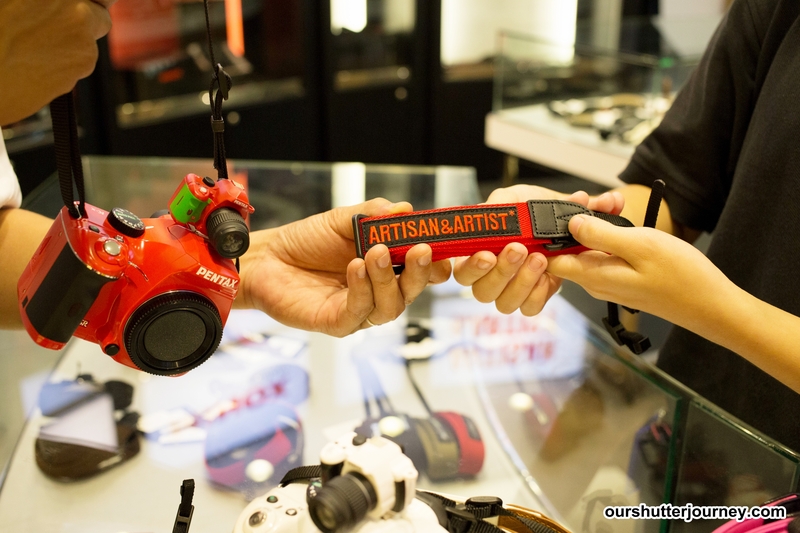 And discovering Artisan & Artist* has more than just camera bags, they made high quality camera straps too! 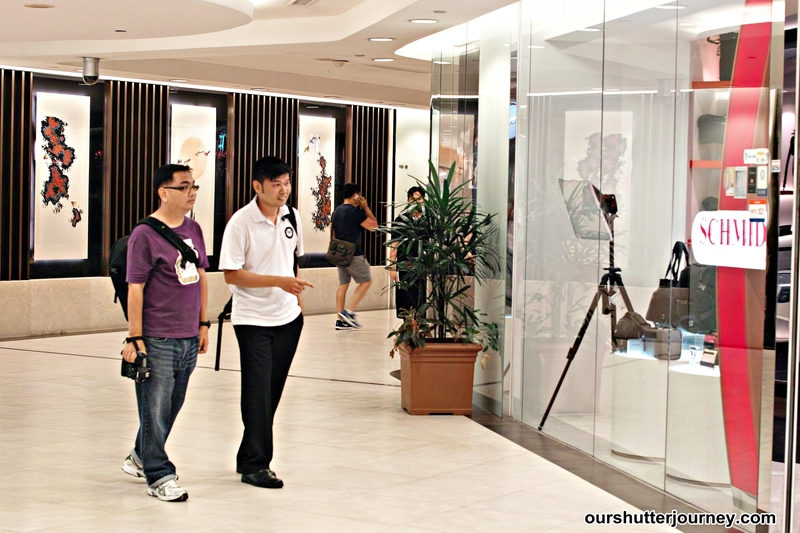 So next time if you are in Orchard, do pop by. This entry was posted in Brand: Others (Cosina, Carl Zeiss, Leica, Mamiya, Samyang, Vivitar, Zenitar,etc), Featured Photographers, Featured Photography Merchants, Photography Articles & Videos, Uncategorized and tagged Artisan & Artist*, Prank, Schmidt. Bookmark the permalink. I’m a journalist and photographer in Ontario Canada, meanwhile, I used to be a big fan of Artisan and artist camera bags and straps since I was in U.K, I was thinking about to buy this new model camera strap, but I decided to given up after I notified the following issue. However, couple days ago, my Japanese wife found some online articles posted on the Yahoo Japan with absolutely incredibly disgusting issue about the mother company of Artisan and artist cheating local users by selling bags and straps imported from China in the name of “made in Japan” . It says, the company of Artisan and artist was bought by a China company named: Schumit marketing Asia HK Ltd a few years ago. 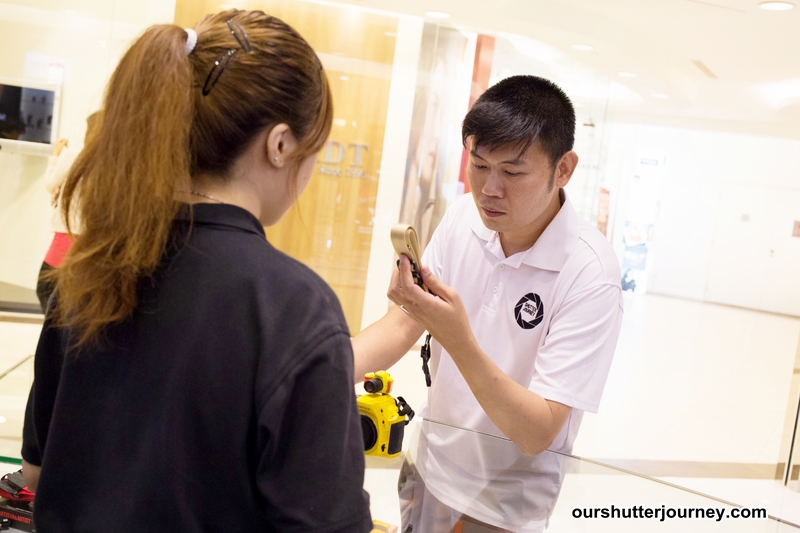 Since then they started importing camera bags,straps from a Mainland China manufacturer,then they add the same country of origin label of “made in Japan” to those bags and straps and keep selling in local market and export to outside of Japan,in order to cut down production cost. However, they didn’t announce this to public and keep selling products as “made in Japan” with same prices but lower quality. To be honest,as I am a fan of Artisan and artist, I don’t want to believe this is the true, but if it is, i need to announce this to the public such like posting to camera related magazines or websites, in order to avoid more and more fans of users to be cheated!! I believed there is some truth in this but I was also told by Schmit Marketing that this is a rumor by competitors. But thanks for sharing. I will try to find out more. Thank you for the heads up. Dear Dennis Romaniello, since you are a writer, its best not to listen to rumors. Things “heard of” are usually untrue as words can always be manipulated. 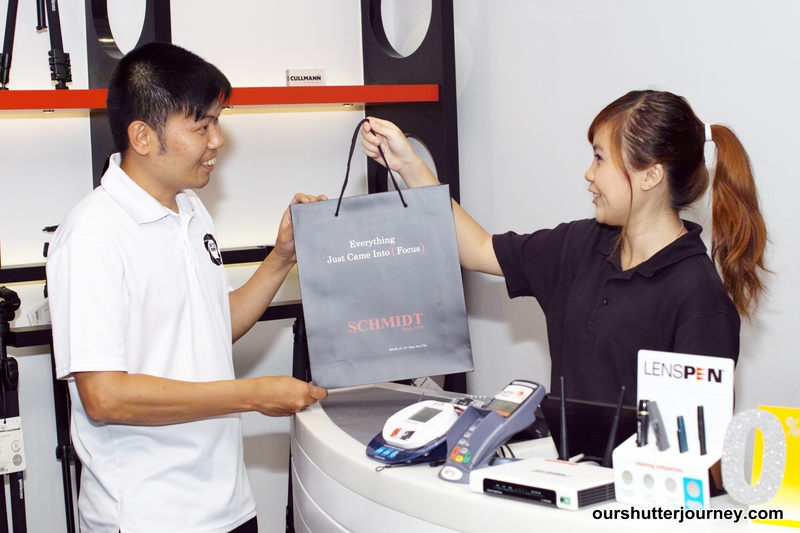 Please visit – https://www.facebook.com/SchmidtMarketingSingapore to see the Official letter from A&A.